The 2 major factors that effect how you rank your website in local searches today are the consistency of your citations and the quality and quantity of your NAPs (NAP = Name, Address & Phone number) across all your business listings. Citations are simply the occurrences of your business information across the web and include directories like Yelp, Google My Business, Facebook and CitySearch to unstructured citations on press releases, photos and Youtube videos. It’s important to note that your NAP has to be the same accurate information everywhere it is found online. If not, you run into all kinds of duplicate issues that not only confuse the search engines but people searching online for your products and services, often resulting in splitting your reviews across several pages. This is bad for your business and we don’t want it to happen at any cost. If the NAP information is consistent and accurate, then it’s a good thing and you will benefit, usually with improved rankings and more leads. If this information is inaccurate, it still spreads, but damages your ability to rank locally. The duplicate and erroneous data is extremely difficult to clean up. Until now! 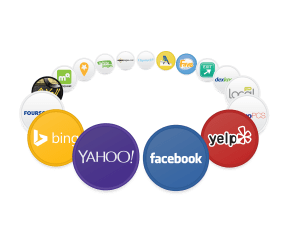 Blend Local Search Marketing are now partnering with a leading citation company which enables us to use their unparalleled access to powerful local data aggregators over 50 local business directories to claim, clean and optimize our clients directory listings. No more fragmented business listings that are inaccurate, out of date or vague. By using this new location management software are client listings have a guaranteed presence, Rich Listings, PowerListings+ Content Lists and Review Tracking. Location citations – setting up consistent listings generates over 45 citations. Citations are a key component of local search engine ranking algorithms. Mobile Presence – provide listings on premium apps without needing a mobile friendly site or mobile media ad buy. In 2019, more local search will be happening on mobile devices than online and the vast majority is in apps. We ensure you are listed in the most popular ones so your customers can find you on the go. We guarantee you will be listed correctly on all of our partner sites with the enhanced content you provide. To get found online, Contact us today to get a clean citation profile for your business.